Mauve (H2) flowers, VIII–IX; buds are distinctly white at the base; dark green foliage; height 46–60cm; spread 31–45cm. Wild-collected; found in the L'Ancresse area of Guernsey by David McClintock (Platt, Kent, England) in 1969. Named after the area where found on Guernsey, Channel Islands. Deep mauve (H3) flowers, VIII–IX; dark green foliage; prostrate; height 10–15cm; spread 31–45cm. Similar to, but more floriferous than, 'Mrs Ronald Gray'. Wild-collected; found in Dorset, England, by former surgeon to H. M. The Queen, before 1973; introduced by Knap Hill Nursery (Woking, Surrey). Lady Maithe has not been identified, but presumably she was the wife of the royal surgeon. Lavender (H3) flowers, VIII–IX; yellow-orange foliage; the shoot tips are pink in winter; spreading, the new shoots curling down, hence its name; height 10–15cm; spread 26–30cm. So called because the habit of the new growth resembles lambs' tails. The cultivar name is spelled as one word, not two. ♤ Rich brick-red buds, VIII–XI; dark green foliage; upright, bushy; height 26–30cm; spread 31–45cm. A sport from 'Alexandra', found by Paul & Werner Wolf (Seligenstadt, Germany) before 1997; named by Kurt Kramer (Edewecht-Süddorf, Germany). Small, dark crimson flowers; IX-X; foliage orange turning red in winter; habit erect; height 30cm; spread 45cm. Name is an allusion to the flowering time and flower colour, and to the foliage colour. White flowers, VIII–IX; golden yellow foliage throughout the year; compact; height 10–15cm; spread 26–30cm. Seedling; found by David McClintock in his garden at Bracken Hill (Platt, Kent, England); introduced in the Netherlands and Germany by 1982, when the name was given in error as 'Lemon Jam'. An allusion to the colour of the foliage. White flowers, VIII–IX; light yellow foliage; upright; height 26–30cm; spread 31–45cm. Introduced by W. R. A. Parsons (Wood Close, Upper Woolhampton, Berkshire, England) by 1981. Name alludes to the colour of the foliage. ♤ Pink-purple ("rosalila") buds; VIII-X; habit upright; after 5 years 60cm tall, 50cm spread. Seedling selected by Johannes van Leuven in September 2007: Named after Lena Keyseres. ® C.2009:07 registered on 26 November 2009 by Johannes van Leuven, Geldem-Liillingen, Germany. Mauve flowers; IX–X; yellow-green foliage in summer, changing to rusty red in winter; dense and prostrate; height to 10cm; spread to 25cm. Seedling; found by Clive Benson in his nursery (Farington, Preston, Lancashire, England); introduced by Benson before 1993. Lavender (H3) flowers, VIII–IX; mid-green foliage, new growth in springis salmon and crimson; height 16–20cm; spread 31–45cm. Named after the late Mr L. Slinger, director of Slieve Donard Nursery, Newcastle, Northern Ireland. Mauve (H2) flowers, VIII–IX; orange foliage; erect; height 26–30cm; spread 46–60cm. A striking plant. Wild-collected; found in the Uig area on the west coast of Lewis, Outer Hebrides, by W. S. Dobson (Edinburgh, Scotland) about 1970; introduced by J. R. Ponton (Kirknewton, Edinburgh, Scotland). Named after the island on which it was collected, and the flower colour. Amethyst (H1) flowers, VIII–X; dark green foliage; broad, bushy habit; height 26–30cm; spread 46–60cm. Lavender (H3) flowers, VIII–X; bright green foliage; upright; height 31–45cm; spread 46–60cm. ♤ Violet buds, VIII–XII; dark green foliage; erect habit. Long-lasting display of buds. Deliberately bred seedling from 'Amethyst' and "97-18-15"; raised and selected by Kurt Kramer. ® C.2006:09 registered 25 December 2006 by Kurt Kramer, Edewecht, Germany. ♤ Bud-flowering; buds H5 (ruby), 5mm long, to 2mm diameter; VIII-IX; foliage dark green; habit upright; height 30cm; spread 25cm after 3 years (pruned). Buds show colour three weeks earlier than ‘Athene’ or ‘Amethyst’. Sport on ‘Loki’, found by J. van Leuven, Geldern-Lüllingen, in autumn 2007. White flowers, IX–X; lime-green foliage, turning almost white in spring; upright; height 26–30cm; spread 31–45cm. A useful plant to use where other yellow-foliaged lings are found to scorch. 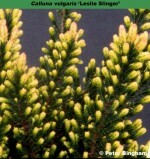 Seedling; found by John L. Jones (Glynwern Heather Nurseries, Cilcennin, Lampeter, Dyfed, Wales) by 1990. Mauve flowers, VIII–IX; yellow-green foliage, shoot tips orange throughout the year; porstrate yet with erect stems; height 10–15cm; spread 26–30cm. ♤ Bud-flowering, white (RHS 155C-155D); VIII-X; foliage bright green all year; height 25cm; spread 25cm after 3 years(pruned). Sport from ‘Barbara’ found in autumn 2004 at Edewecht, Germany, by Kurt Kramer. ® C.2011:06 registered on 12 February 2011 by K. Kramer, Edewecht, Germany. ♤ Bud-flowering (Knospenblüher), violet; mid VIII-X; foliage silver-green; habit: upright; height 45cm; spread 35cm across after 5 years (not pruned). Later to flower than ‘Loki’; more upright. Deliberately raised seedling, raised before 2010, selected in September 2013. EU-Sortenschutz VL-13-7 (Lisann). ® C.2015:02. Registered by Johannes van Leuven (Geldern, Germany). ♤ Bud-flowering; purple red; VIII-X; foliage green-gray; habit upright; height 50cm; spread 50cm after 3 years (not pruned). Shows colour as early as mid-August. Deliberately raised from two unnamed seedlings, cross made by J. van Leuven in August 2010; selected in August 2011; to be released in 2015. ® C.2013:04 registered on 25 October 2013 by J. van Leuven, Johannes, Geldern-Lüllingen, Germany. Lilac-pink (H11) flowers, VIII–IX, in short spikes; mid-green foliage; dwarf, compact habit; height 10–15cm; spread 21–25cm. A seedling found on the grave of J. G. Flecken's father at Kerkrade-Holz, The Netherlands. Registered 23 December 1993: J. G. Flecken, Kerkrade, Netherlands. Flowers mauve; VIII-IX; foliage grey-green; habit low-growing, creeping with swirling branches; height 12-20cm; spread 45cm after 7 years. "One of the lowest silvers. Both 'Grey Carpet' and 'Silver Cloud' are much taller than listed here. It has a more swirling pattern than those two." Chance seedling found in her nursery and propagated by Karla Lortz. Pacific Northwest Native American name for a local river. ® C.2008:10 registered on 25 August 2008 by Karla Lortz, Shelton, WA 98584-8429, USA. ❁ Rose pink (H7 flowers, IX–XI; gold foliage turning orange-red in winter; height 21–25cm; spread 31–45cm. Prone to damage by windburn. Sport on 'Peter Sparkes'; found by J. F. Chattaway at Llanbedrog, Gwynedd, Wales, in 1969; introduced by A. Annabel (Ravenshead, Nottinghamshire, England) in 1975. Named after town where the finder lived. White flowers, VII–IX; bright green foliage; height 16–20cm; spread 31–45cm. Named after a lake near Crieff, Perthshire, Scotland. Pale lavender (H3) flowers, VIII–IX; grey-green foliage; prostrate, slow growing; height 10–15cm; spread 10–15cm. Introduced by R. J. Brien (Pitcairngreen Heather Farm, Perthshire, Scotland) in 1963. Long racemes of lilac-pink flowers; VIII-IX; foliage dark green; habit upright; height 45cm; spread 55cm. Seedling; found by B. G. (Jack) London (Taverham, Norwich, Norfolk, England) in 1971. Named after Jack London; the name should not be rendered as 'London's Pride'. White flowers, VIII–X; bright green foliage; height 31–45cm; spread 31–45cm. Good for use as cut-flowers, and widely used in breeding programmes. Presumably a sport; found in a batch of cuttings at the municipal gardens at Driebergen-Rijsenburg, Netherlands; introduced by Plantsoendienst Gemeente (Driebergen-Rijsenburg, Netherlands) in 1962. Name is an allusion to the flower colour and the flower spikes. Bud-bloomer, calyx lilac (HI); IX-XI; foliage mid-green; habit broad, bushy. Deliberately bred seedling; raised by Kurt Kramer in 1991 (sister-seedling of 'Fritz Kircher'). Named after Mrs Loni Kircher, wife of Fritz Kircher, President of Gesellschaft der Heidefreunde. This cultivar should not be confused with Calluna vulgaris 'Loni' which is also named after Mrs Kircher, and which is not a bud-bloomer. Registered on 3 November 2002 by Kurt Kramer. Crimson (H13) flowers, VIII–X; yellow-green foliage in summer, going bronze-red in winter; upright, compact habit; height 31–45cm; spread 31–45cm. Found by Fritz Kircher before 1989 and named after his wife. Registered 1 September 1994: Fritz Kircher, Hamburg, Germany. ♤ Bud-flowering (Knospenblüher), buds red, small, VIII-X; foliage green; habit: upright; height to 45cm; spread 35cm across after 5 years (not pruned). Later to flower than ‘Loki’; more upright. Deliberately raised seedling, raised before 2010, selected in September 2013. EU-Sortenschutz VL-13-5 (Lore). ® C.2015:01. Registered by Johannes van Leuven (Geldern, Germany). White flowers; VIII-X; foliage green with slight bluish tinge; habit low, flat; height 10cm; spread 30 cm. One of the best, creeping varieties. 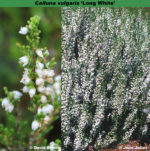 ♤ White flower buds, larger then 'Alicia'; IX-XI; foliage light green; habit erect; height 35 cm; spread 25 cm after 2 years. Sport on 'Alicia', found by Hermann Glaser (Babenhausen, Germany) in 2004. ® C.2008:05 registered on 4 May 2008 by Kurt Kramer, Edewecht, Germany. ♤ Flowers-buds blue-pink to violet (RHS74C–78C), 4mm long, 1.5mm across; VIII-X; foliage dark green with mid-green new growth; habit upright; height 30cm' spread 25cm after 3 years (pruned). Early flowering. Deliberately raised seedling, cross made in October 2005 by Helmut Hiedl; selected in October 2006. ® C.2014.04: registered on 9 January 2014 by Helmut Hiedl, Altrusried-Krugzell, Germany. Flowers white, single, IX-X; foliage yellow. "Habit strong, erect. Has the same characteristics as 'Long White' (healthy, strong, erect growth)" but is distinguished by the bright yellow foliage; it is also clearly not the same as 'Fortyniner Gold'. Sport on 'David Hagenaars'. Found by H. J. Kuipers in his nursery in 1998. Named after H. J. Kuipers' son. ® C02.2004 registered on 24 September 2004 by H. J. Kuipers, Nijensleek, Netherlands. Mauve (H2) flowers, VIII–IX; dark green foliage; upright; height 31–45cm; spread 46–60cm. Typical of the wild ling in the region from which it got its name. White flowers, IX–X, in elegant spikes; very dark green foliage; vigorous ,upright; height 46–60cm; spread 46–60cm. Ideal for use as cut-flowers, but prone to fungal problems. Finder unknown; introduced by R. Lyle (Alloa, Clackmannanshire, Scotland). Name alludes to its flowers and flowering time; and after Ronald Lyle. White flowers, VIII–IX; distinctive, feathery, dark green foliage creating a lacy effect when in flower; height 31–45cm; spread 46–60cm. Wild-collected; found in Morayshire, Scotland, by Ronald E. Lyle (Alloa, Clackmanonshire, Scotland) by 1965. Lavender (H3) flowers, VIII–X, small; mid-green foliage; very compact; height 10–15cm; spread 26–30cm. Found by B. & V. Proudley (St Briavels, Gloucestershire, England); introduced by B. & V. Proudley in 1968. Named after the younger son of Brian & Valerie Proudley (see also Calluna vulgaris 'Andrew Proudley').